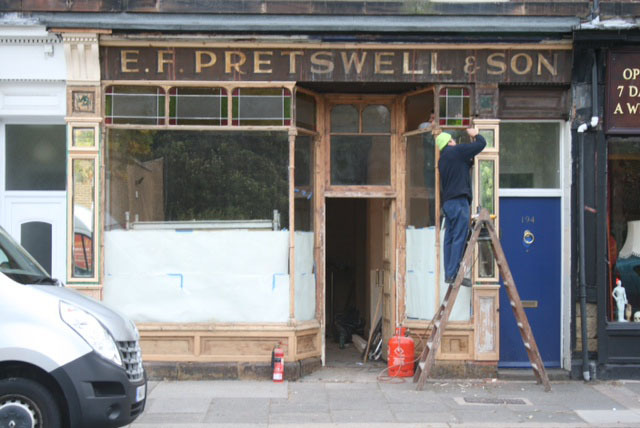 In October 2013, builders renovating premises at 194 Heaton Road uncovered this old sign. The ‘ghost sign’ prompted us to try to find out who the father and son were, what their shop sold and when they were in business. The story went back even further than we thought, 160 years. Edmund Forbes Pretswell was born near Edinburgh in 1853, the son of a shepherd. In 1861, he was aged 8 and living with his parents, two older brothers and sister at Broomhill Farm, Liberton in Midlothian. Unfortunately, we don’t currently have much information about Edmund’s early years but we do know that by 1876, at the age of 23, he had moved south and married a young woman from Chester-le-Street. Their first child, also named Edmund Forbes, was born in her home town a year later. By 1881, Edmund senior and his new family had moved to Newcastle, where the growing population meant excellent prospects for someone with enterprise. Edmund’s occupation is described in directories as ‘grocer and provisions merchant’. According to the census of that year, the family of the Scottish shepherd’s son were doing well enough to be occupying three properties in Byker (32 and 34 Byker Bank and 1 Quality Row) and employing a servant. One of the properties seems to have been Edmund’s first shop – possibly even the one pictured here, which was apparently just north of Leighton Street on the west side of Byker Bank. The photograph was given by Edmund senior’s grandson, Norman, to local historian, Mike Greatbatch, who has kindly shared it with us. Edmund Forbes Pretswell senior’s Byker Bank shop. possibly with Edmund hismself standing in the doorway. Over the next 30 years, we can track Edmund’s growing family and expanding business. He had various shops in Byker Bank, added others in Shields Road (115 and 179) and Tynemouth Road. By 1891 Edmund and Jane, his wife, had 7 children and were living at 17 Heaton Road in a house quite recently demolished and replaced with a modern building housing a medical practice. The Pretswells soon moved to a brand new home on Wandsworth Road from where they continued to run the Tynemouth Road shop. But soon after the turn of the century, though still in business in Heaton, perhaps as a further sign of their growing prosperity, the family moved out of Newcastle, first to Cullercoats and then to Willington Quay. This photograph of their Willington Quay shop was sent to us by David Pretswell, the younger Edmund Pretswell’s great nephew. Meanwhile, Edmund junior was following in his father’s footsteps. The first records we’ve traced where he is listed as a grocer are shipping log books. In September 1905, aged 28, he set sale in steerage class from Southampton to Algoa Bay in South Africa. However he returned just two months later. He seems to have already been married by this time: maybe he’d gone to check out the possibility of taking his young family to make a new life there? But whatever the reason, he was soon back and by the following year, 1906, he had taken over the family shop on Tynemouth Road. By 1911, he and his wife, Thomasina, had three children and were living in Wandsworth Road, just across the road from his parents’ former home. By the following year, his father, by this time approaching 60, seems to have retired while young Edmund was running shops in both Tynemouth Road and Chillingham Road (number 186). 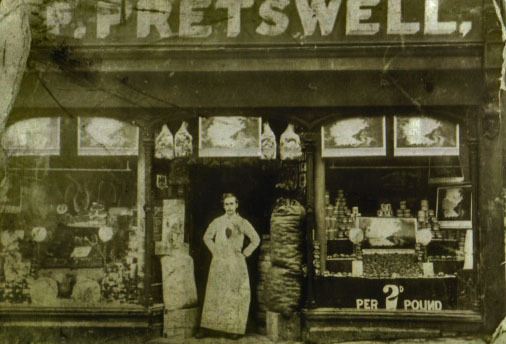 And by the outbreak of World War 1, Edmund Forbes Pretswell junior had opened a new shop at 194 Heaton Road under the name: EF Pretswell & Son. The shop was a fixture on Heaton Road for over 40 years – until about 1956. So the recently uncovered lettering is between 100 and 57 years old. In 1956, the Heaton Road shop was acquired by a growing local grocery chain called Hadrian Supply Company. By 1968, this company had 30 branches in Newcastle alone, including at 258/262 Chillingham Road, 176 Newton Road and 175/181 Shields Road. However, by 1973 only one shop remained on Stamfordham Road. It seems as though the business had been sold to a supermarket chain. We would like information about it and also the businesses which occupied the Heaton Road premises between then and the recent kitchen shops, Kitchens Plus and Wren’s – as well as what will come next! 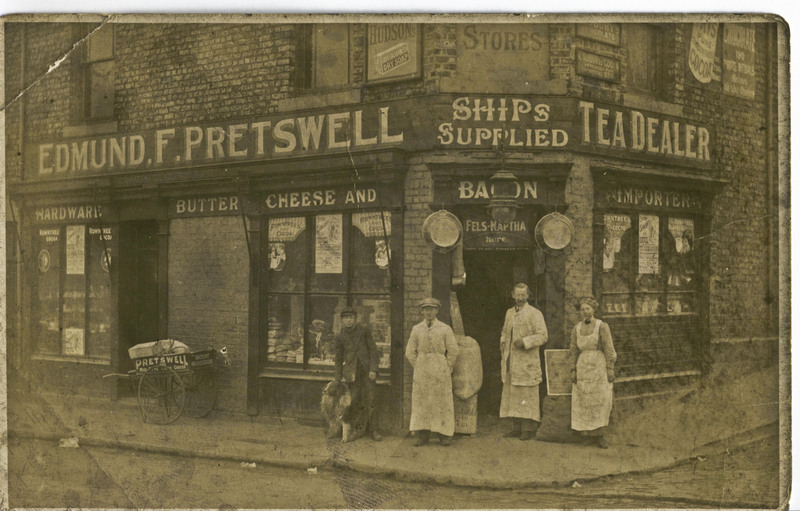 This entry was posted in Research and tagged Byker, Chillingham Road, Edmund Forbes Pretswell, grocer, Hadrian Supply Company, Heaton Road, kitchen shop, Kitchens Plus, Shields Road, shops, Tynemouth Road, Wandsworth Road, Willington Quay, Wren's, WW1 on October 28, 2013 by oldheaton.